Recently, I was in Washington D.C. for a speaking engagement. After the event was over, a friend and I went out to dinner. I began to worry about how I would get back to my hotel in an unfamiliar city. I was reluctant to sit out and wait for the bus on a night when the temperatures were deathly cold. My friend, who has been living in D.C. for about a year, told me that I could get a wheelchair accessible taxi. Skeptical, I googled wheelchair accessible taxi companies in D.C. and called the first number I found. Within 20 minutes, a wheelchair accessible taxi pulled up in front of the restaurant. I was so impressed that I used the same company to get a cab to the train station the next day. That cab arrived within five minutes, with a friendly and knowledgeable driver. I was stunned. "I'm a New Yorker." I told my friend. "Wheelchair accessible taxis are like unicorns to me." Unfortunately, I wasn't exaggerating. Five years ago, a new, modern taxi, the NV200, was chosen as the winner of the Taxi of Tomorrow contest. After a lawsuit brought by people with disabilities and disability organizations, a settlement was reached that 50 percent of the NYC taxi fleet would be composed of accessible cabs by 2020. 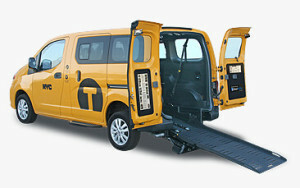 The new, wheelchair accessible NV200 was unveiled in 2013. However, court case after court case has delayed the implementation of accessible taxis in NYC, leaving wheelchair users like me stranded. Taxi drivers complain that a wheelchair accessible taxiisless convenient, less valuable, and harder to operate. Others allege that since the accessible taxis allowed by the city are not hybrid cars, the decision to have 50 percent of the fleet accessible by 2020 violates an earlier mandate that some taxis must be hybrid and fuel-efficient. Meanwhile, the wheelchair accessible taxi fleet still make up only a small fraction of the total cabs in New York, making it nearly impossible for wheelchair users to hail a taxi like any other person. Theoretically, wheelchair users in NYC can get an accessible cab by calling 311 or the dispatch center, texting a specific number, ordering online, or by using the Wheels on Wheels (WOW) Taxi app. However, because of the shortage of accessible cabs, the service is unreliable and cabs often take a long time to come. It is inherently discriminatory that wheelchair users cannot hail a cab on the street like everybody else. Yet time and time again, court cases have slowed the pace of progress to a crawl. With the recent worry over ride sharing companies like Uber and Lyft, wheelchair accessible taxis could allow the Taxi and Limousine Commission (TLC) to gain a leg up. Currently, Uber's WAV program allows people to request a wheelchair accessible vehicle in the outer boroughs of NYC and in Manhattan above 110th street. 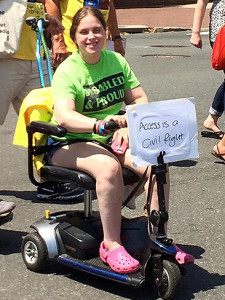 And in response to backlash, Uber has been rolling out wheelchair accessible options in cities like Washington D.C. If the TLC fulfills the promise of at least 50 percent of the fleet being wheelchair accessible taxis by 2020, wheelchair users would be able to hail a cab wherever they were in the city, rather than requesting an Uber only in specific areas. Though taxi drivers are concerned about the affordability of driving a wheelchair accessible taxiwhile in competition with ride sharing services, I firmly believe that the increased business from wheelchair users would cover any additional costs to driving an accessible cab. New York City has been referred to as "the greatest city in the world" by the new hit musical Hamilton. We need to make sure that our city lives up to that reputation for all people, not just the nondisabled.